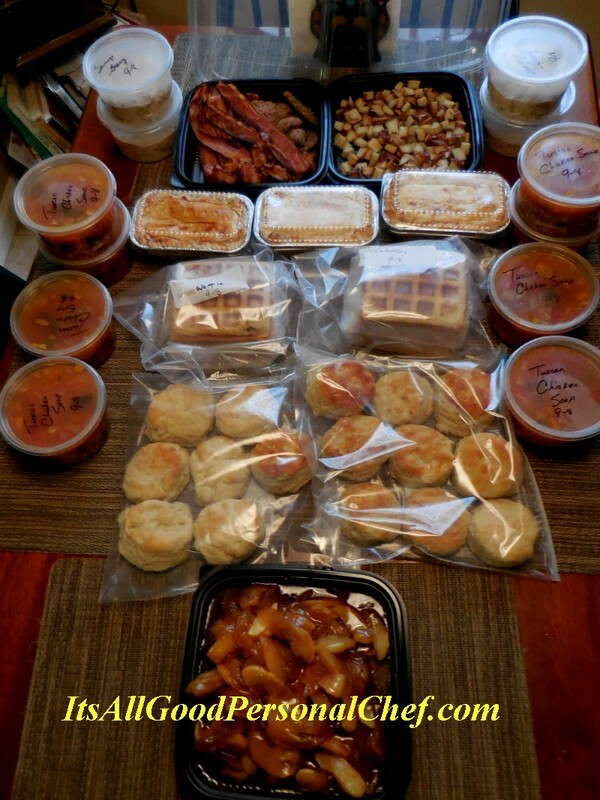 Some of my clients know exactly what they want, how they want it prepared and stored. Others, for lack of a better term, are lost. All they know is they need help. I recently received a call from a family who was suffering with a mother who was diagnosed with a terminal illness. In a few short weeks, she went from being a vibrant, energetic lady who had the world by the tail to someone who needed 24-hr care. Suddenly, arrangements had to be made for others to do all the things Mom had always taken care of. A housekeeper was hired to change the bedding and clean the house every week. Home health aides and visiting nurses took care of Mom’s personal and medical needs. The only chore left to take care of was the one thing they never saw as a problem – How to provide nutrition for their ailing mother and the rest of the family. Mealtime had become a combination of carry-out, home delivery, “Can-o-crap” and tasteless boxed entrées from the super market. Needless to say it didn’t take long for the family to discover their meals weren’t just unhealthy and unsatisfying; the convenient food they were eating was becoming very inconvenient. A former co-worker and friend learned of their dilemma and hired me to do several cooking sessions. The family had never heard of a Personal Chef or had any idea such a service was available, but they were excited to give it a try. To say it was a hit would be an understatement. The family couldn’t remember when they last had a home cooked meal or fresh, made from scratch Dumplings and desserts. While talking to the mother-in-law of the ill woman, I learned the family was running out of prepared dinners early in the week because they were eating them for more than one meal of the day. I suggested the next time I come to cook I prepare some breakfast and lunch type meals so they don’t have to rely on so many cans of soup and frozen pizzas.. I also learned, from lack of exercise, pain medication and poor diet, the ill woman had suffered from severe constipation. I quickly remembered a concoction my grandfather’s nurse had recommended called “Power Pudding”; A blend of equal portions of pureed prunes, apple sauce and bran. Taken with a full glass of water, it certainly provides the “power” needed to move things along. I offered to mix some up at my next session. The next cooking session resulted in a bit of everything. Not photographed is a jar of Power Pudding. I added a little cinnamon and vanilla extract to make it a bit more palatable. What started as me preparing a few home cooked dinners turned into a large variety of breakfast, lunch and dinner items along with some mouthwatering desserts and healthier snacks.